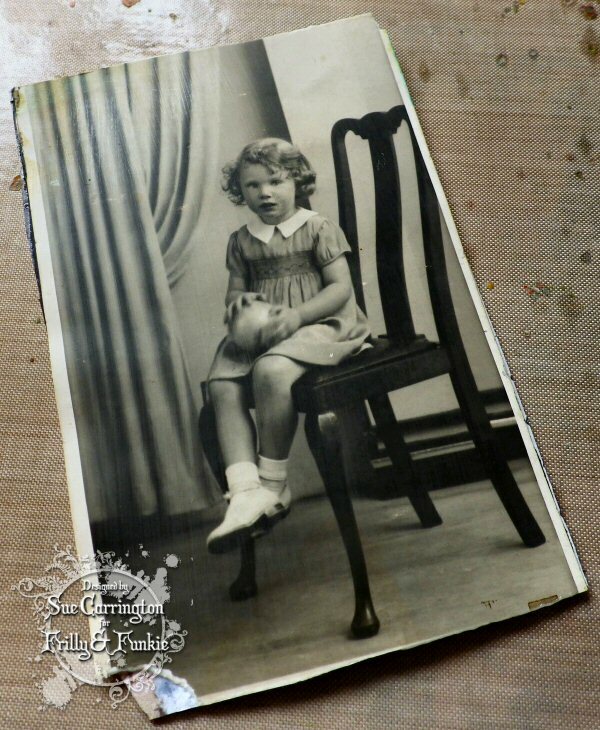 I'm back with a short post today, I'm sharing all the nitty gritty from my project on Wednesday on the Frilly and Funkie blog. So, for all the details on how my Christmas screen together you'll need to hop over to Frilly and Funkie. With Christmas quickly approaching I've chosen the theme of: 'Tis the Season!' I'm keeping it super simple. 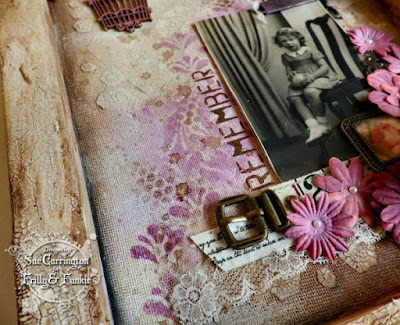 You may create any type of vintage or shabby chic holiday themed project - whatever winter holiday you celebrate! I decided to make a Christmas screen, but I'm not sharing too many details today as I'll be back on Friday to show you how it came together. 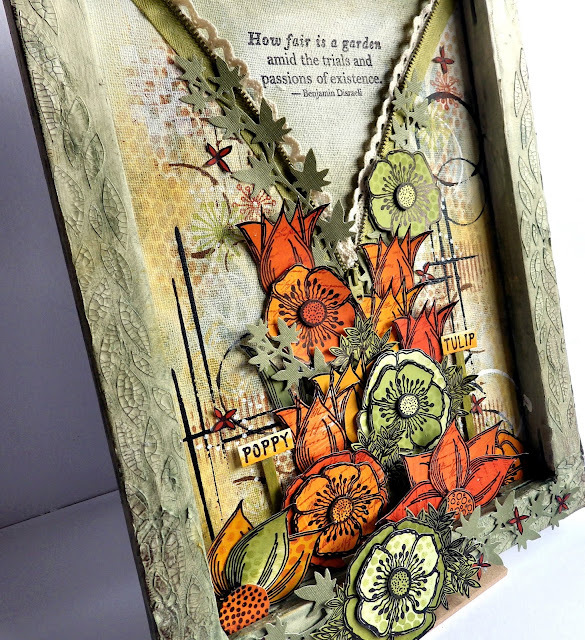 The panels were all cut using the Tim Holtz Arches die and then used Distress Inks to get some colour down. 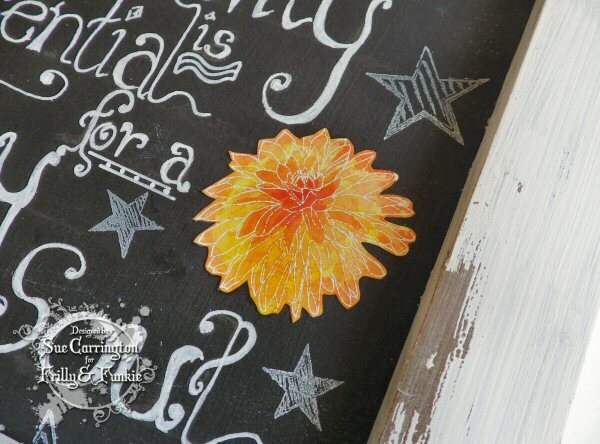 I did some spritz and flick and then stamped using Archival inks. To add more splatter I used a white Sharpie pen, flooded it and then flicked it at the panels. 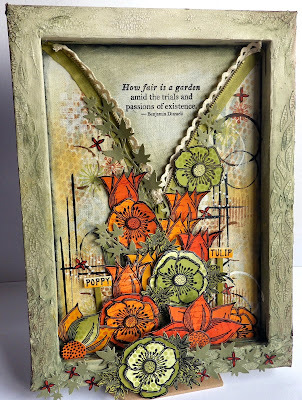 The holly leaves and berries are done with embossing powders and the text on this panel is also done with embossing powder. 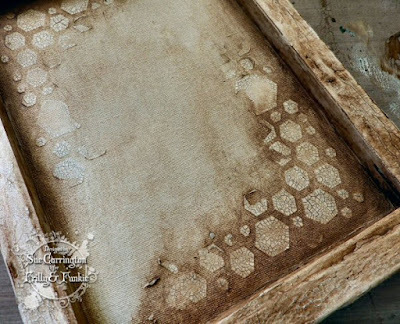 I used the Tim Holtz snowflake stencil with Wendy Vecchi's gold embossing paste which the above photo has picked up beautifully. I die cut lots of greenery using the Tim Holtz die and added a little embossing powder to these too. I'll leave it there for now and fill in all the details on Friday, so make sure you pop back then ! 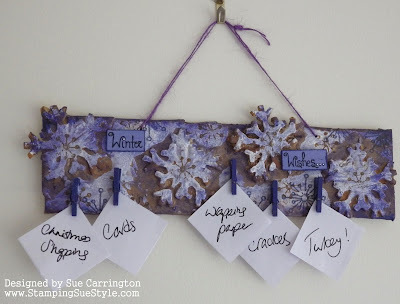 Grungey Christmas reminder board ! Hello ! 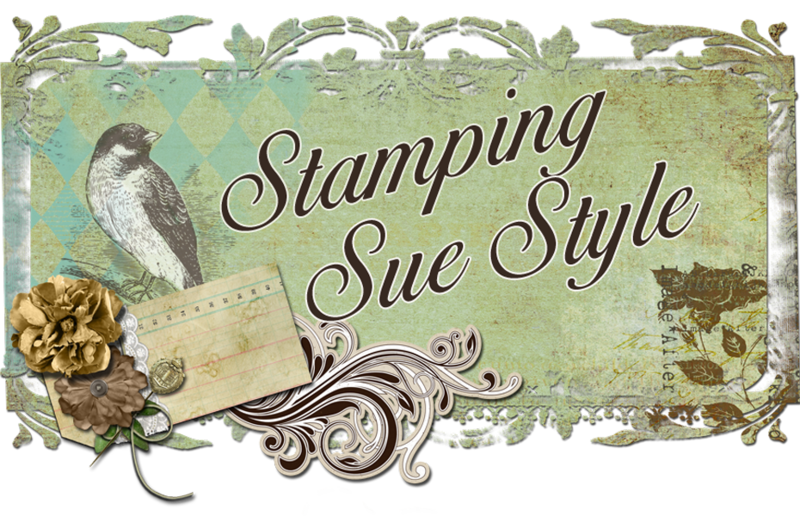 Today we're kicking off the new challenge over at Stamps and Stencils and we also have a few changes happening. 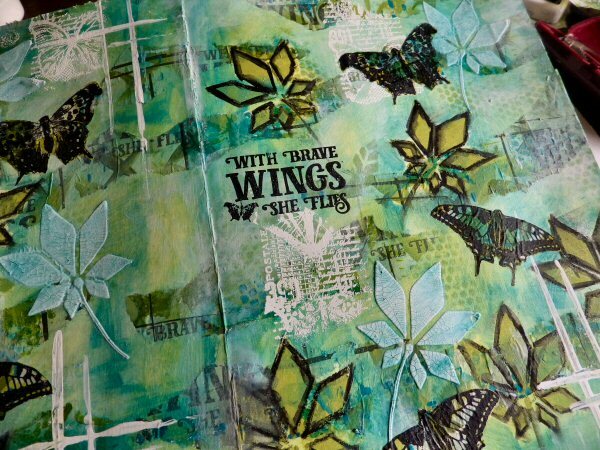 So to find out what's happening make sure you hop over to the Stamps and Stencils blog. I love Christmas but I'm a little shy when it comes to the bling, glitter and tinsel bit. We'd like to see you step away from the normal Christmas colours and create a mixed media piece which has a real touch of grunge. 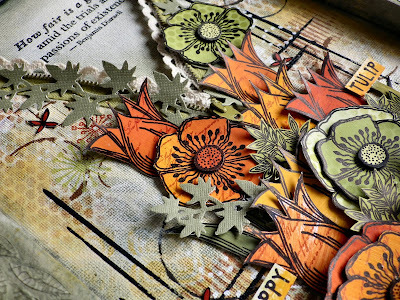 Think alternative colours, layers, antiquing and all things which are not pristine red and green! 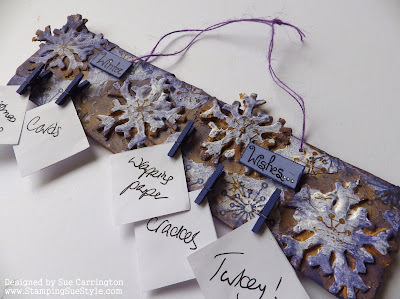 Remember to add in some stamping or stencilling too! I'd got an offcut of some greyboard and also grabbed some pieces of paper. 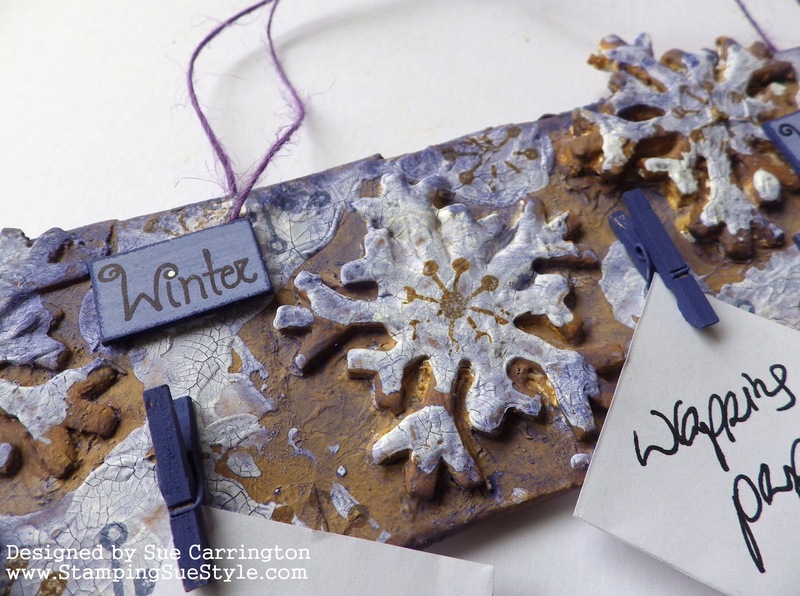 I covered the greyboard with torn up pieces of paper to create some texture, then glued these large snowflakes to the board. 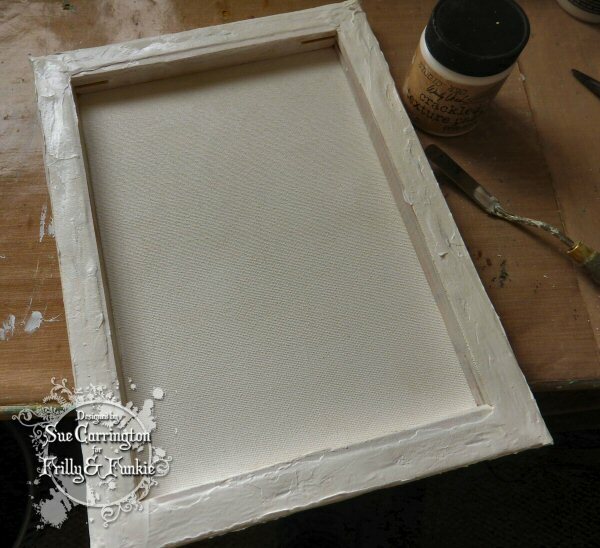 I then painted it with Gesso and then with Caramel Fresco Finish paint. Still not sure where I was headed but keeping grunge at the forefront of my mind, I then used Toffee Fresco Finish paint over just the snowflakes. 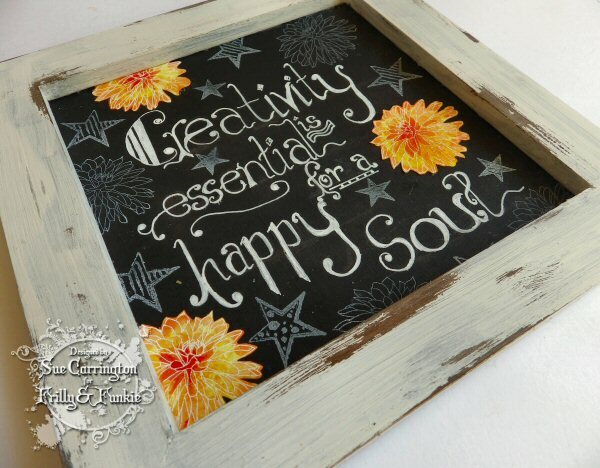 I've skipped a couple of steps here, but I used some Prima Crackle Paste and a spatula and spread it over the whole piece in random places. 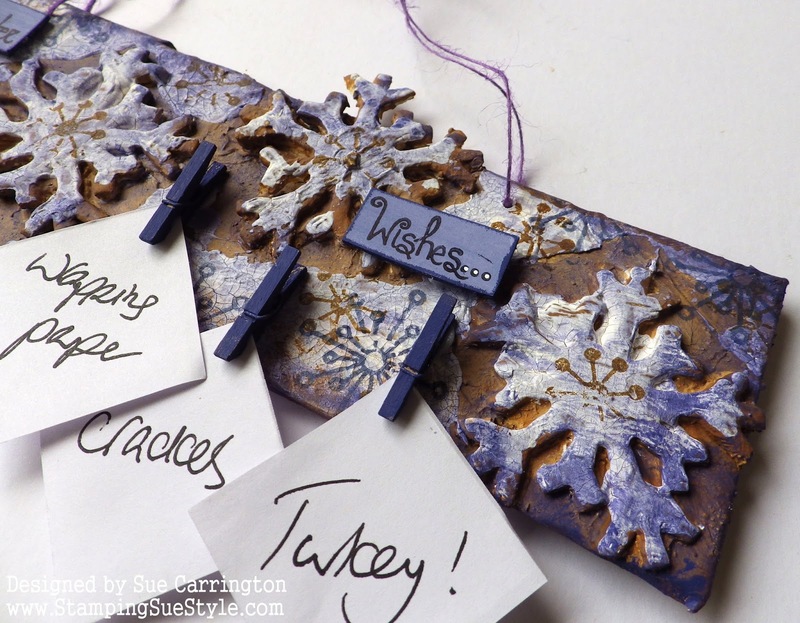 I then used an Emma Godfrey stamp with Potting Soil Archival ink and stamped over the board and on the snowflakes. I used watered down Purple Rain Fresco Finish to add some colour. 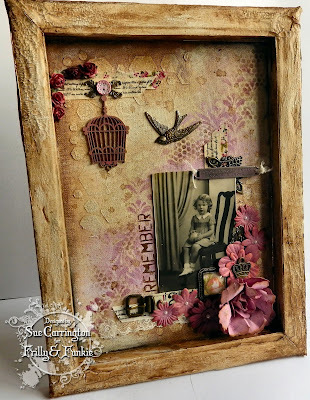 The two words are from a Darcy Wilkinson stamp set and I've stamped onto painted mountboard. The little pegs have also been painted with Purple Rain and then glued into position. All that was left to do was add the reminder notes ! 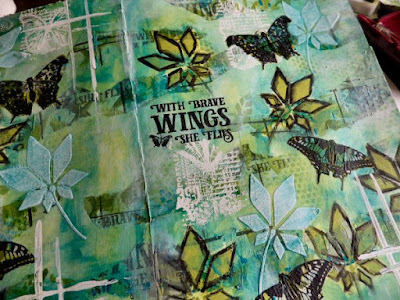 I hope you get chance to join us for this challenge and do make sure you hop over to Stamps and Stencils to check out the rest of the DT's fabulous projects. I'm back tonight to share just a sneak peek as I'm showing the full step by step over on the PaperArtsy blog. So for all the details of how this journal page came together you'll need to hop over to the PaperArtsy blog. It is time to transform something you have sitting around or can pick up for a song and make it one of your works of art. 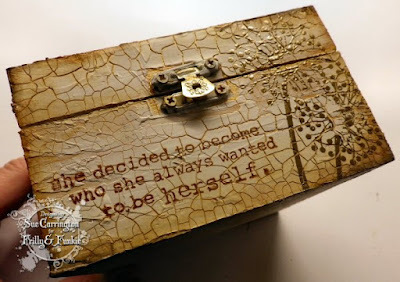 It could be a frame, a bottle, an old cigar box, a discarded CD - the list is endless. Just make sure your final transformation is vintage or shabby chic. So I took a good look around and spotted a little box that I bought some time ago and thought now was the perfect opportunity to give it a makeover. 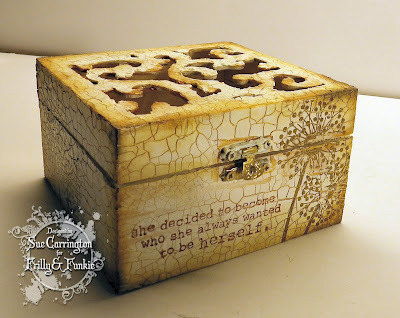 I didn't take a before photo but this was a plain box just waiting to have some attention ! 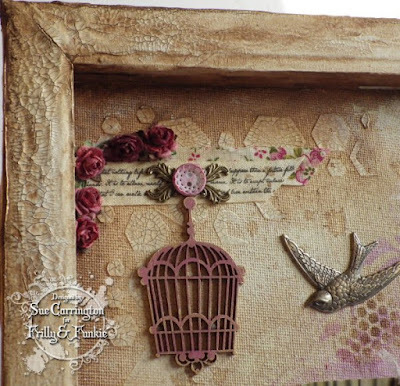 I first of all coated it with Wendy Vecchi's gold embossing paste. 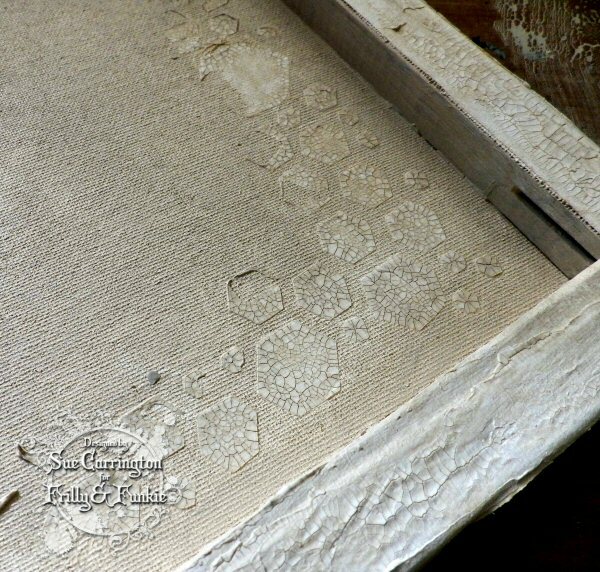 When it was dry I then spread Wendy's Crackle Paste all over it and left it to dry naturally. I find the cracks are far more impressive if you have a little patience. 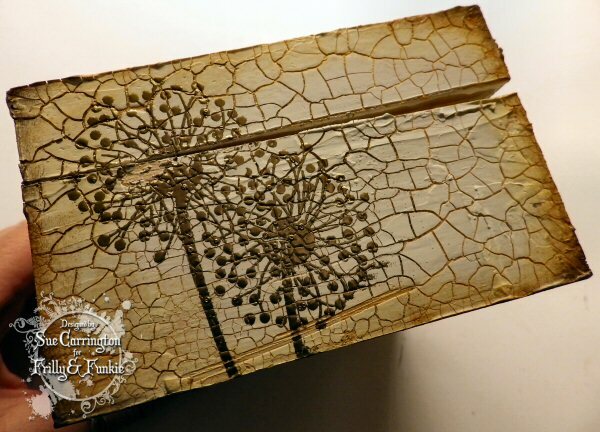 As you can see I was not disppointed, the cracks are quite possible the best result I've ever had ! This kind of made my thought process go in a different direction too as I really didn't want to cover the gorgeous cracks. I then used the Yvonne Blair stamp with gold embossing powder, and I absolutely love the effect on the crackle. 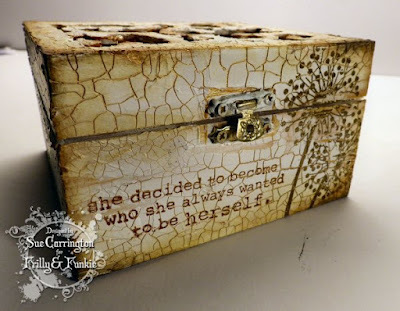 I stamped and gold embossed all around the box, and on the front I used another Yvonne Blair stamp with Potting Soil Archival ink. 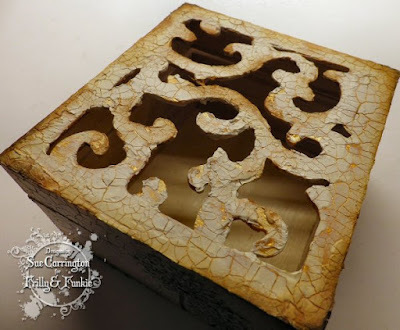 The gold embossing paste shows through the Crackle Paste beautifylly and the lid remided me of old metal where the layers are flaking away through age. 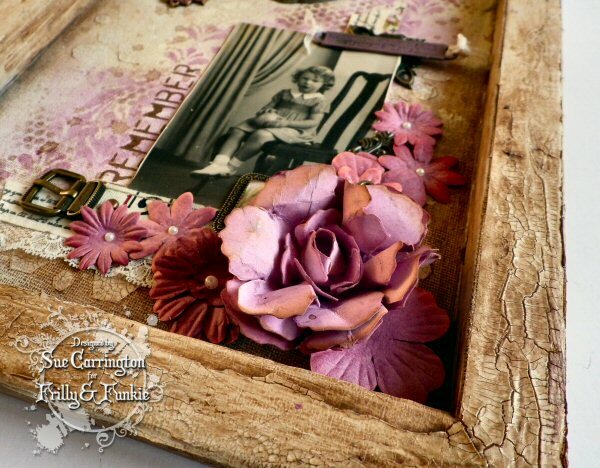 To give it a more aged look I used Tree Branch, Potting Soil and a touch of black Archival inks around the edges and in particular on the corners. 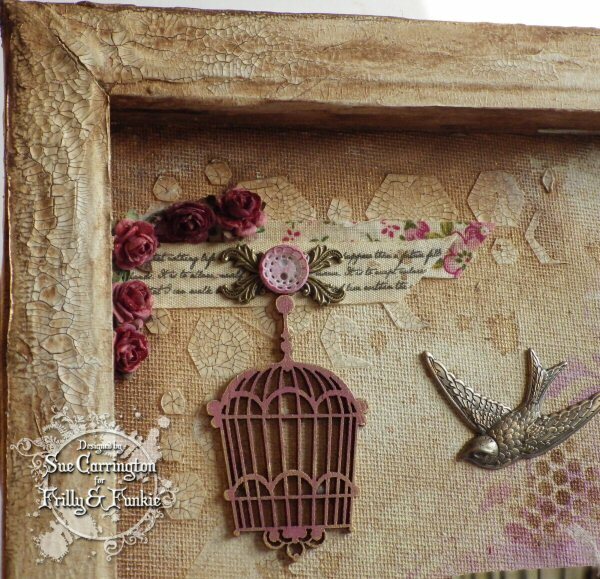 I then put away all the embellishments I'd got out as I really quite like the simplicity and of course the crackle ! I hope you get chance to join us for this challenge and do make sure you hop over to the Frilly and Funkie blog to check out the rest of the DT's fabulous projects. We're kicking off the second week of the current challenge over at Frilly and Funkie today. I am the host for this challenge and one of the things I don't like at this time of year is the lack of light to craft by in the evenings. So, for this challenge I'd like you to include something in your project that makes reference to light, this could be a lamp, lantern, rays of light or even gradients of colour that get lighter! 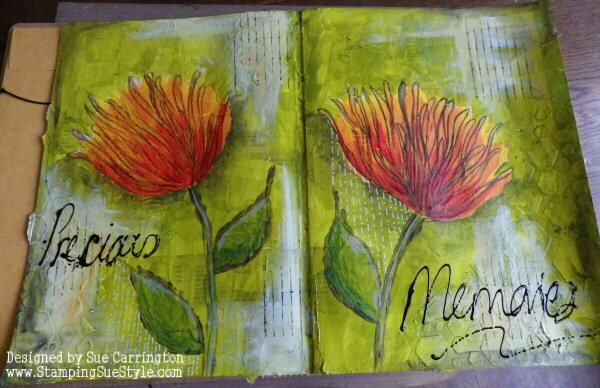 I decided to create a journal page and bring some light into it. 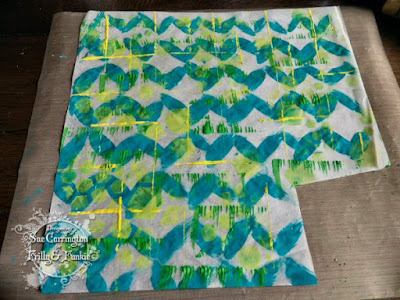 I attended a Dina Wakley class recently and one of the things that we did was to make our own paper from tissue paper and acrylic paint. 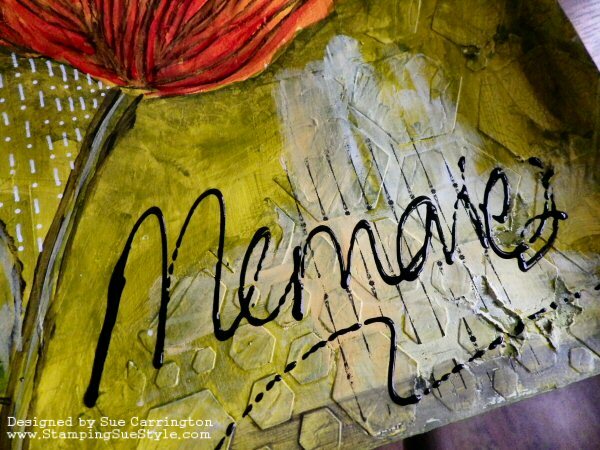 This is where I started, using Dylusions paints and makeing brush strokes and dipping a plastic card into paint to make lines. It's actually quite therapeutic ! 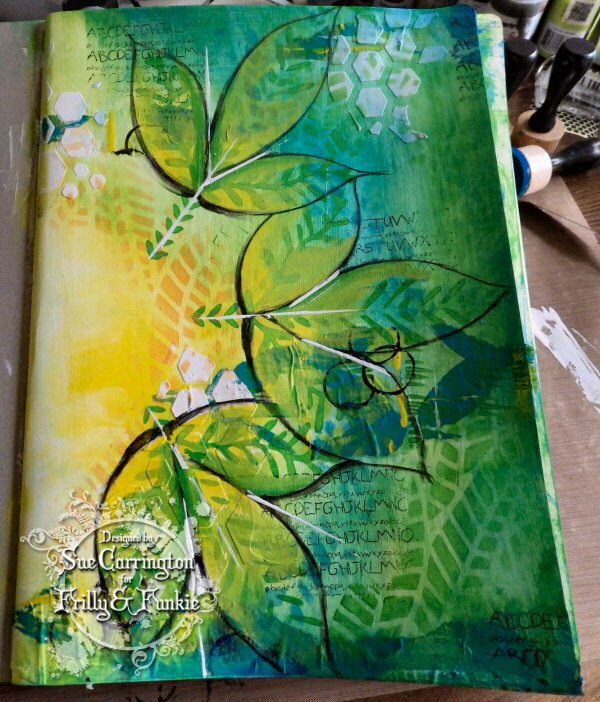 I gessoed the journal page then used a mixture of a baby wipe and my finger to blend Dylusions paint over the page keeping the light colour separate and blending to darker colours. I tore up the tissue paper and glued pieces over the page. Then I used the Dylusions honeycomb stencil with heavy white Gesso to add some texture. 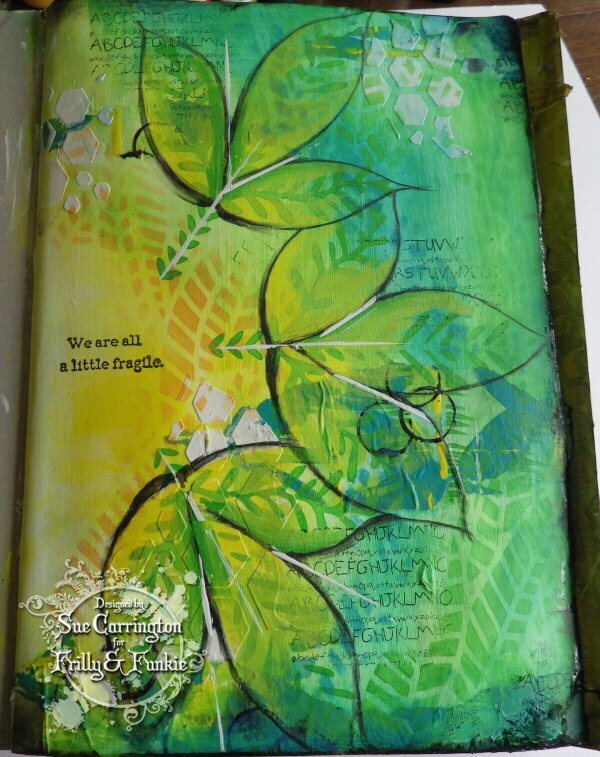 I then used a Dina Wakley stencil to create the centre of the leaves and stencilled with the Dina Wakley Jungle stencil. 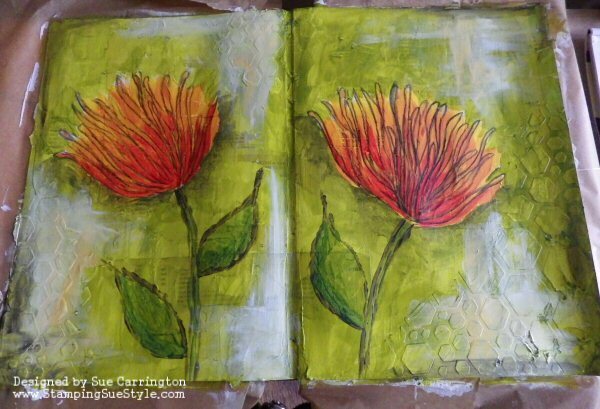 I then used a watercolour pencil to sketch in the leaves and used a damp brush to smudge the pencil. 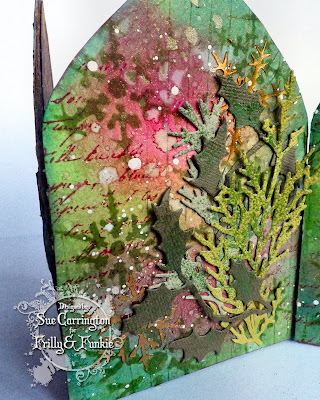 I used the Wendy Vecchi A to Z background stamp and did some random stamping. 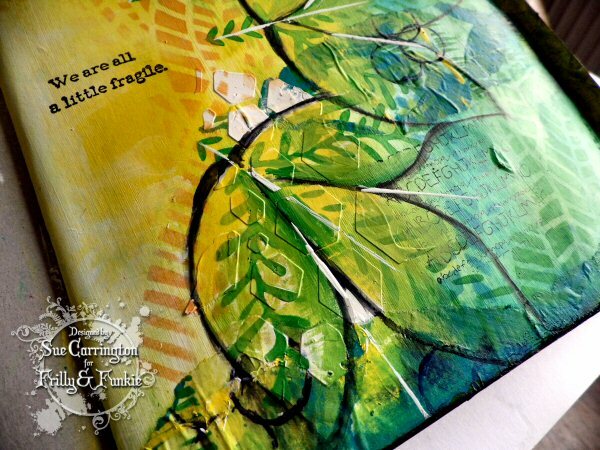 I then used a plastic card dipped in some Gesso and created some lines through the leaves. 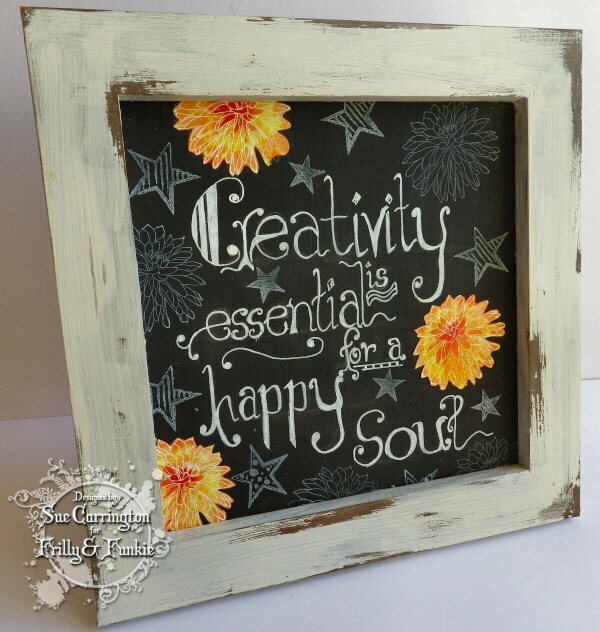 To make the centre as bright as possible I used my finger and rubbed some Gesso along the edge, then I stamped the sentiment which is a Dina Wakley stamp. 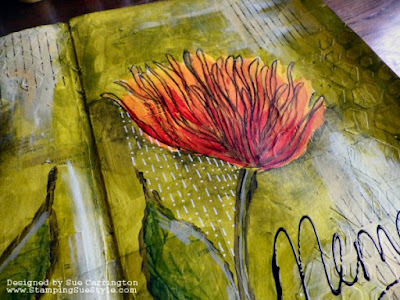 I used some black Dylusions paint around the edge of the page to distress it. I hope you get chance to join us for this challenge and look forward to seeing how you create some light in your projects. 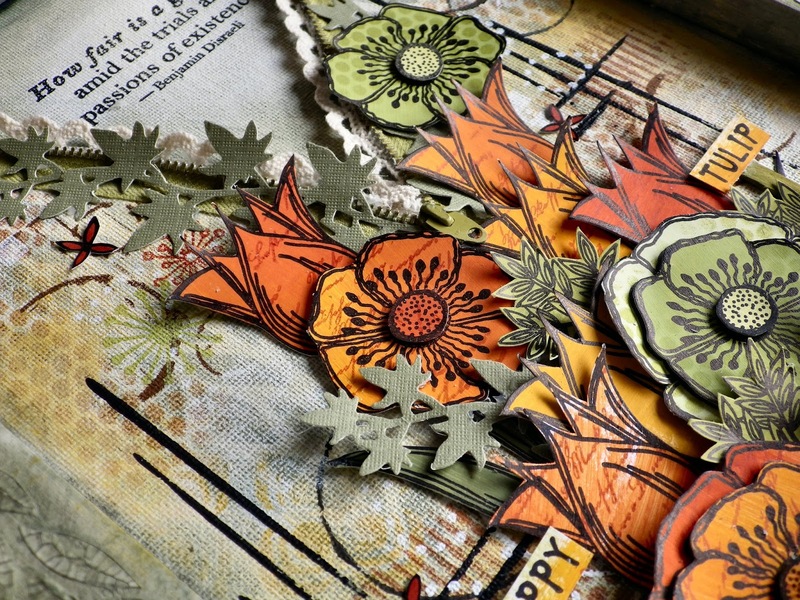 Make sure you hop over to the Frilly and Funkie blog to check out the rest of the DT's fabulous projects. It may be the 5th of November today (Bonfire Night in the UK) but for this challenge we want to see mixed media projects inspired by 'favourite memories', you can interpret this in any way you like as long as you include some stamping or stencilling in your mixed media piece. 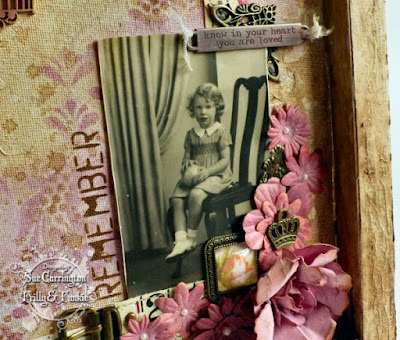 What we want to see is how a favourite memory has inspired you, so don't forget to mention this in your post. We are also have a DT call so if you love mixed media and would like to join us make sure you hop over to the Stamps and Stencils blog for all the details of how to apply. 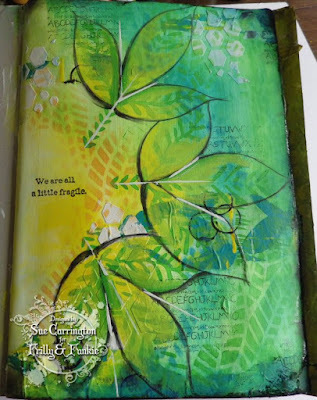 I started the journal page with a Dylusions stencil and Art Basics Crackle Paste. 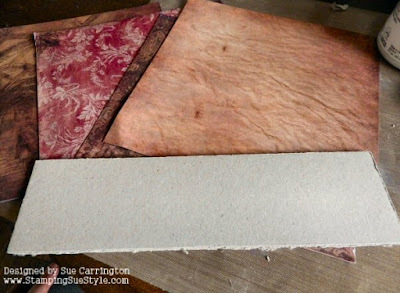 Then I stuck some torn pieces of book page in random places, When it was dry I scraped Heavy White Gesso down both pages but not smoothing it down so it would create some texture. I then painted the heads of the flowers, building up the colours of Fresco Finish paints. Before adding the red I used a Stabilo pencil and drew in some petals and used a damp paintbrush over the pencil which creates a smooth black line. 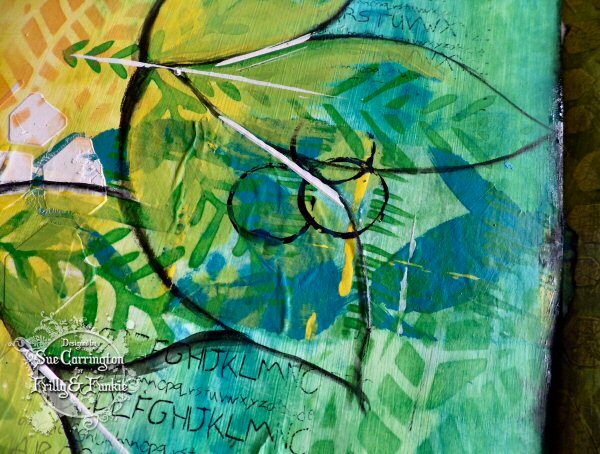 I painted in the stalks and leaves using a a small flat brush then using my finger I rubbed some Gesso over random places. I used the Basket Weave Wendy Vecchi stamp with black Archival ink over the Gessoed areas. 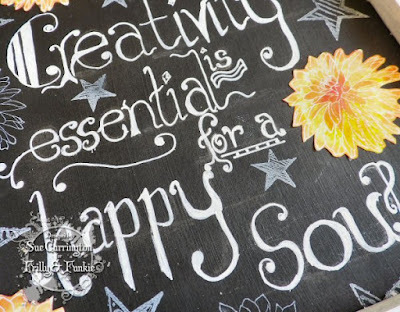 To write the words I used Dina Wakley black paint with a fine tip applicatot. 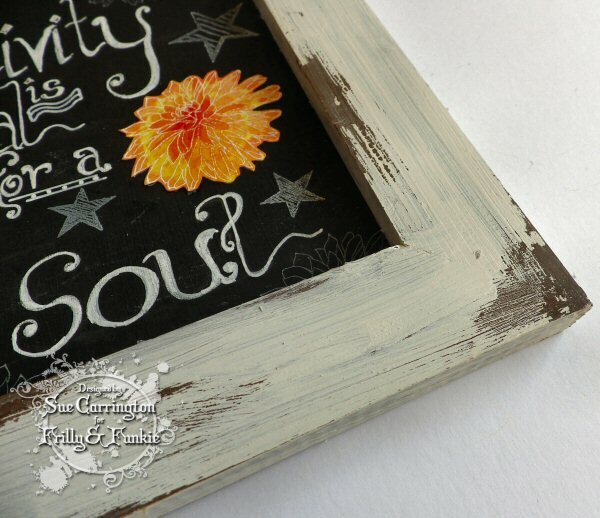 I didn't quite manage to get the paint flowing enough when I wrote the word Precious, but it's a learning curve ! 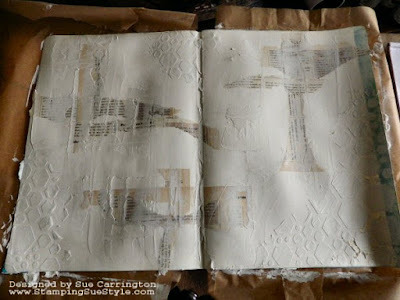 To add some extra detail I used a white Sharpie pen and drew some dots and dashes on both pages. I hope you get chance to join us for this challenge and we look forward to seeing what memories you're going to share. 3D and a hop ! I'm back today with my project for the new challenge over at Stamps and Stencils. It's been 6 months since the challenge blog was started so by way of a celebration we're having a hop and there is also a prize. 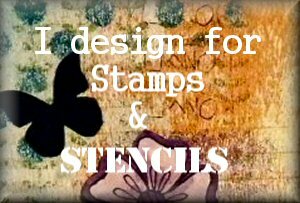 So do make sure you hop over to the Stamps and Stencils blog for all the details. I am the host for this challenge and have picked the theme Whatever it is make it 3D. 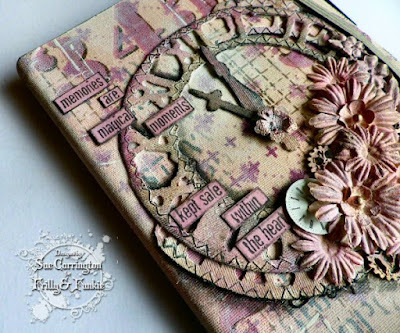 So, this should you give you a pretty wide field to play in, just remember that we're a mixed media challenge and you need to include some stamping or stencilling. Life has taken an unexpected turn for me this week so I've not been able to create a brand new project so thought I would share more details of a project that was planned for a workshop that has had to be postponed. 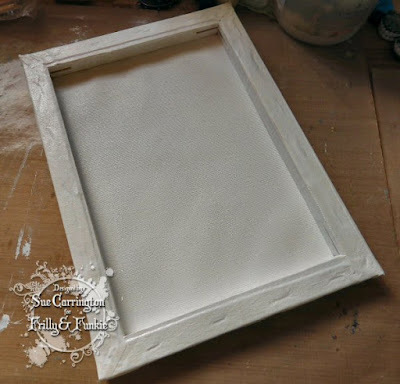 I started with a framed canvas and flipped it over to use the recessed side. 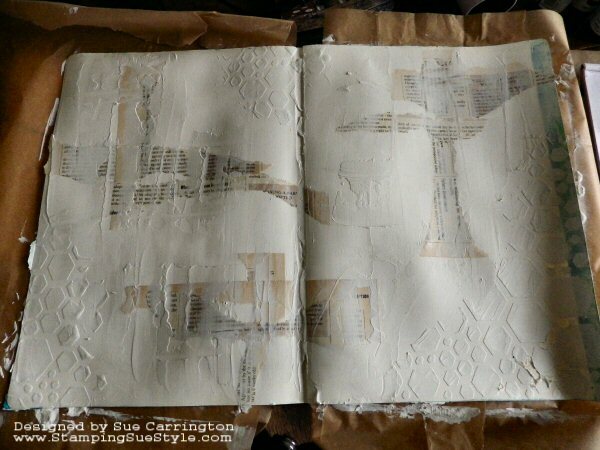 I covered the staples with masking tape then gave everything a coat of Gesso. 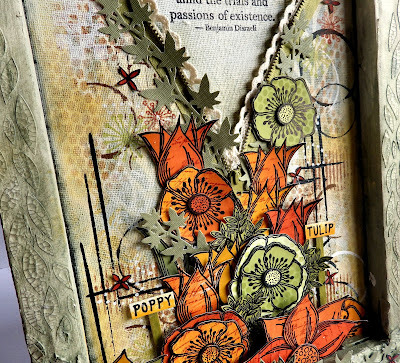 I used Wendy Vecchi Crackle Paste around the edges through a Dina Wakley stencil. 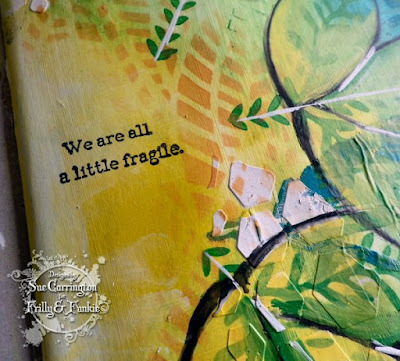 I wanted the cracks to still be visible after painting so I used Sage Fresco Finish paint with Satin Glazing Fluid which makes the paint translucent and also lets the colour sink into the cracks. 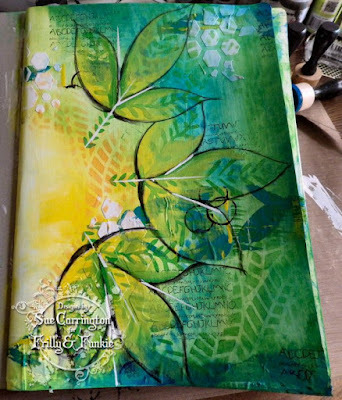 I did this with two further shades of green, again mixing them with the Glazing Fluid. 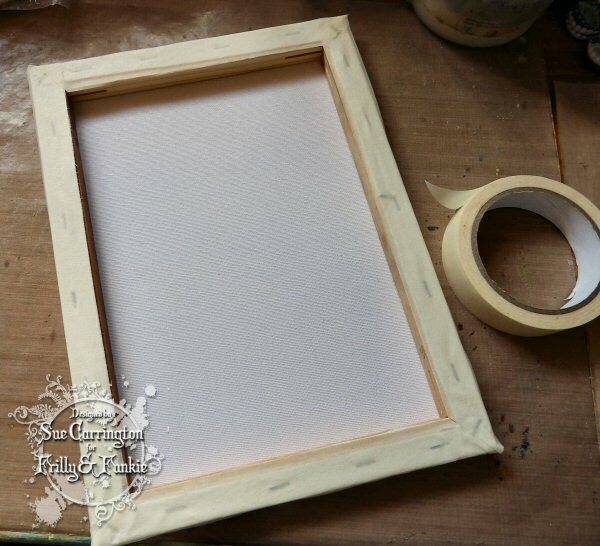 I wanted to include a zip through the centre of the project and marked where it would go with a pencil then painted in the area of the opened zip before glueing it in place. 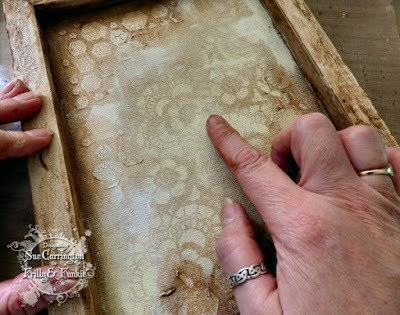 I then stencilled and painted with my finger building up the layers of paint, using the Glazing Fluid to allow me to use opaque Frescos as translucents. I used a plasitc card dipped in Litle Black Dress Fresco Finish paint to create the lines and a lid from a hair mousse can for the circles. The flowers are all from the new Lin Brown stamp sets and I've painted Smoothy card then stamped the flowers and cut them out, stamping them more than once and layering them up. 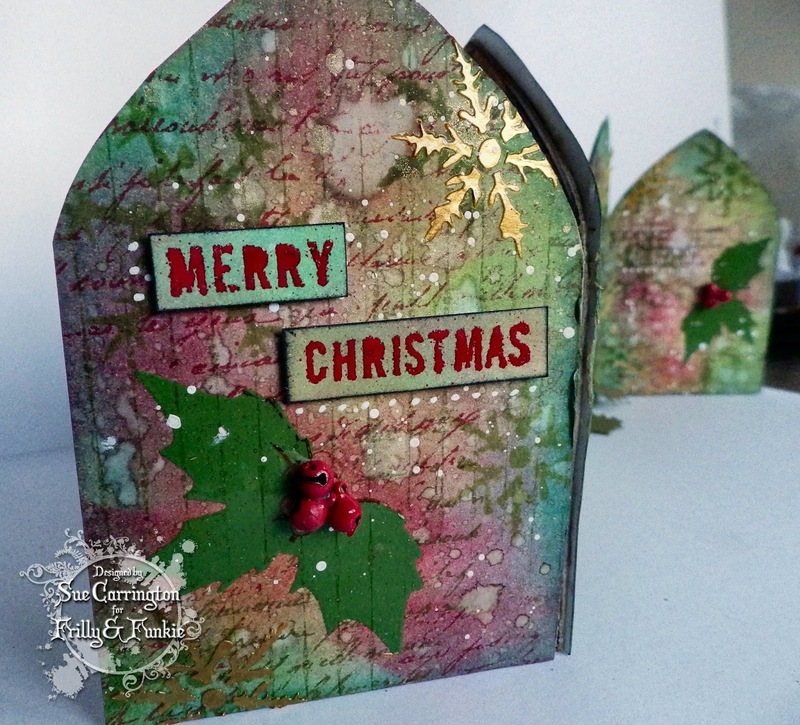 I also die cut some holly using the Tim Holtz strip die. The sentiment in the zip opening is from a Sara Naumann set and I've glued some lace along the zip to frame it. I hope you are able to join us this month for the challenge and if you've arrived here from Toni then you're in the right place and will need to collect the letter 'C' from me.